1. Relish has an official release date! April 2nd, 2013! I'm really excited to get to share this book. It's full color, around 200 pages, and full of stories about growing up among chefs, waiters, and passionate eaters. More on the tour and signings eventually, but for now you can preview it at the Macmillan website, or mark it as "to read" on Goodreads. 2. 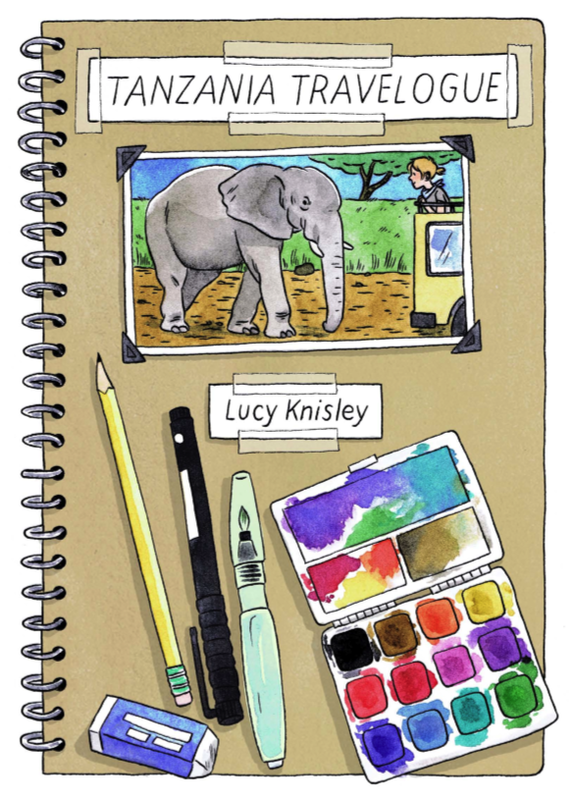 If you haven't yet, please consider buying a PDF of the Tanzania Travelogue! The more digital versions I sell, and the better people like it, the more I will make these and hopefully get to make real books of them, someday! You can buy a downloadable PDF here! 3. I'm also working my way through finishing-- The Age of License (at about 80%), Displacement (Otherwise known as "the cruise comic," again, 80%), and a couple small travelogues about Florence and Seoul (early stages). It's been nearly a year since starting The Age book, but it was a year of finishing Relish, traveling a lot, juggling freelance and settling in a new city. I hope you'll keep being patient, and that you'll like the comics when they're done. 4. All orders are shipped! I went through a period of pretty lame late-orders on books this summer. I thought, erroneously, that I'd be able to sneak in sessions at the post office between crazy travel, but I've been pretty bad about it. But for now I'm home for a bit, and all the orders are shipped. So order more! I was asked to do some sketches of food to help promote Relish. I'm running the sketches on a blog that updates daily. I love having something new to post every day, so I hope to continue it after the sketches run out. I'm going to try to road-trip down to SPX this year! I won't be tabling, but I'll be around. I'm hoping to have some copies of a mini-printing of the collected "Snack Love" paintings in my bag, so if you're interested in getting one, stop me to say hello! Oh the things I do so that people will talk to me. Okay! Available now in PDF and EBook format, the Tanzania Travelogue book can be yours! No word yet on a print version. I'd like to make one, but it's only 60 pages and full color, so it's a little tricky to print. Hopefully someday! Maybe I'll collect all the travelogue work I've been making over the last year (and this summer especially! Three continents in 3 months! ), and put them all in a big book. Maybe I'll wait until I have TONS of travel comics and collect them. Who knows? For now, I'm just making more comics and hoping you guys like them. ●NOTE: If you bought the EBook last week and couldn't read it on your computer, email TCEB @lucyknisley dot com with your lulu receipt attached, and I'll send you a PDF, free of charge. Durn computer readers with their inability to properly format my comics! Back yesterday from a short working trip to Florence, Italy, and headed out again tomorrow on a family trip up with my mom to Canada, where I will read and sleep and decidedly NOT think about travelogueing for a bit. I love LOVE getting to go to all these places, but I am... slightly tired. Maybe three months of jet lag is a bit much. Lately when I'm not going, "Ooh wow!" about new places and new people, then I miss home and my cat and the internet and, you know, sleeping in my bed. ONWARD NONETHELESS. I hope you guys like the comic. Now available as a digital ebook download! See an excerpt on Saveur: Excerpt! Next week you'll be able to buy a PDF for easy reading on your computer. No definite plans for a print version yet, but hopefully someday! I'm proud of this project, pals. I hope you like it. I recently finished a travelogue about my trip to Africa. You guys, Africa is seriously cool. The travelogue will be available soon! It's 60 pages, watercolored, and will be excerpted on Saveur's website, so you can check out a chunk of the story there before you buy it as a digital download. I know I've had all these projects brewing for a while, so it's been a long wait since a big comic piece of mine has been released. Just a little longer for this one! For now, here's the cover! 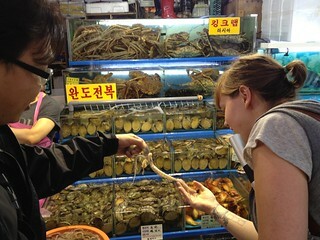 I went to Seoul, South Korea! I just got back 10 days ago. I've had all these amazing travel opportunities recently, and I'm getting some cool work out of it. Travel cartooning! Who knew? Seoul was pretty rad. 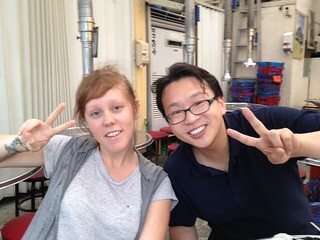 My favorite part was the food tour with Daniel Gray of SeoulEats.com. We spent an afternoon touring around restaurants, street stalls and markets, tasting local delicacies and trying new foods. I also went to Chicago! I went for CAKE, where I had a grand old time. I'm so SO happy that Chicago finally has a great indie comics show. 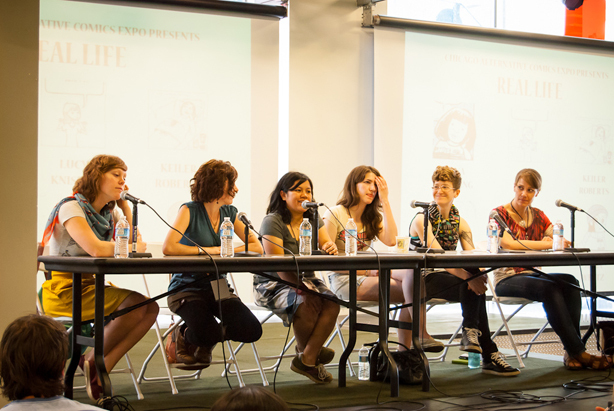 I did a lovely panel there with a lot of great autobio comic artists. I also made use of a little nook I discovered next to my table. 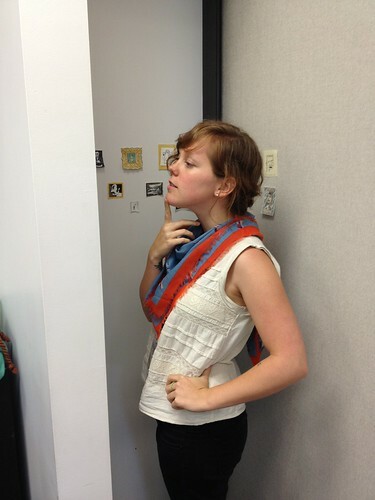 Behold: The World's Tiniest Art Gallery! There were many awesome submissions. Chicago was a nice revisit. I saw old pals, hit up my favorite places and bars, and even got in a restaurant opening with Sarah! See the comic we collabed on over at Sauceome.com! Wellp, I'm off to Florence. I know, I know, I'm the WORST. But there'll be lots of comics from all this! Food evolution! This is what happens when you raise your kids with good, healthy food, and then they get carte blanche at age 18 to eat all the crap they've never tasted before. There was a disturbing incident in my freshman year, involving a week wherein I ate only marshmallows. My current rule when grocery shopping is that if the person in front of me in line has a basket that's healthier than mine, I have to take out some of the crap in my own. Grocery superiority! It's usually not an issue though, because a lot of people at my grocery store seem to mistake "actual food" for "health food," and "fat-free low-carb marketed nonsense" for "actual food." I had a genuinely baffling conversation with my checkout person the other day, when he said to me, "Oh, you're a hippie, huh?" I suppose in reference to my brown bread and canvas grocery bag. What. Hey! I went to Africa! It was AaaaaAah-mazing. Every moment was like the cover of a Zoobook. 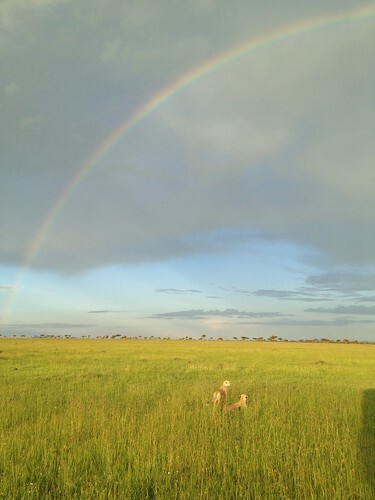 Look at those cheetahs under that perfect rainbow! RIDICULOUS. It was an incredible trip. I'm working on a travelogue about my African adventures, so I'll post when it's done. I realize that my last two travelogues have yet to be seen. I have these gigantic monsters sitting on my desk, pages from completion ("The Age of License"-- about my trip to Europe last fall, and "Displacement"-- about the cruise I took with my elderly grandparents). The cruise comic has ballooned to a ridiculous length (100 pages or so), and License will probably continue to grow beyond it's current 200+ page length to never ever be finished (it was on hold while I finished Relish). But the Africa journal is only going to be around 40 pages! I'm hand-coloring it, just to mess with myself. I'm 22 pages into the pencils for it, which isn't bad for having only a week to work on it so far (no chance to work while I was in Africa. Too many elephants to marvel upon). Keep in mind that I have to pay bills and take illustration jobs as well, so please be patient with me. I love making longer work like this. I love traveling and making travelogues. I love having all these things in my pocket, waiting to be shared. It's a nice feeling. Anticipation! This next year is gonna be craaaazy. Relish, various travelogues, and some amazing adventures to come! I'll be at CAKE, back in ol' Chicago on the 16th and 17th of this month. I'm really excited for this show. Not only because I get to go back to Chi for a visit (Chicago pals, call me! Drinks at the Dubs and dogs at Doug's!) 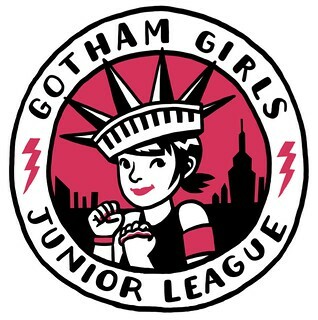 but because I spent 8 years in Chicago grousing about there being no indie comics show there, and now there is! I'm so proud and pleased. Come see me there, and get a preview of my Africa travelogue that I'll be working on. There's a new Stop Paying Attention comic! I'm just finishing up the convention-crowded MoCCA and TCAF couple of weeks. Conventions are so great in terms of meeting readers and other creators, getting to see new work and get excited about the things people are doing in comics. But they're also exhausting and crowded and often covered in germs. I've been exhibiting at shows for a while (since my first one; TCAF when I was 19! ), and I still get a little blindsided by them every year. So much fun and so much overwhelmed craziness, packed into one little weekend. This was the fourth year of the annual Drink and Draw Like a Lady event, and it was another great year. So many amazing ladies came, and ate cookies and chatted about comics and drank wine. 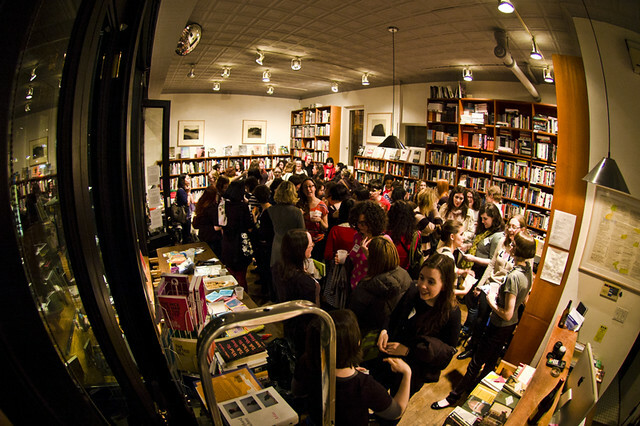 I love being a part of organizing this event, and I love doing it at 192 Books, but so many people showed up that we may have to move it to a larger space next year! Hooray for DDLL! Thanks to Marion Vitus, who took lovely photos all night! 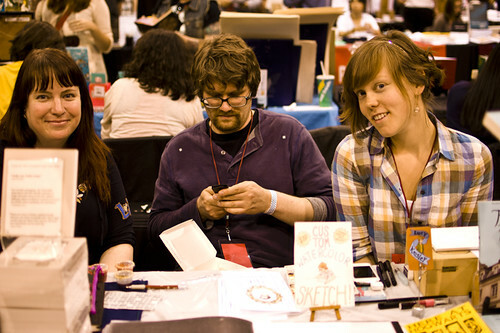 I had my Chicago pals, Sarah and Niles, as houseguests for MoCCA weekend. Sarah (of the lovely food comic, Sauceome) and I ended up sharing a table for the second day of MoCCA, so I got to hang out with them while we plied our wares. I like that Niles is grumpily checking his phone. I think this was the 2nd day and we're all tired. Those guys, like me, love to find delicious things to eat, so I trooped them all over the city for amazing eats, which you can read about and see drawn on the latest installments of Sarah's comic, Sauceome! 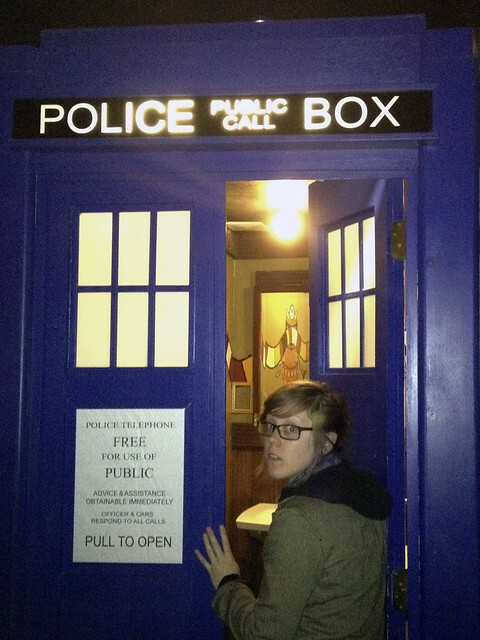 We also visited the Way Station bar while they were in town, otherwise known as "the Doctor Who bar!" It is much like a typical Brooklyn bar, save for a few key differences. You guys, this was a pretty awesome bathroom. 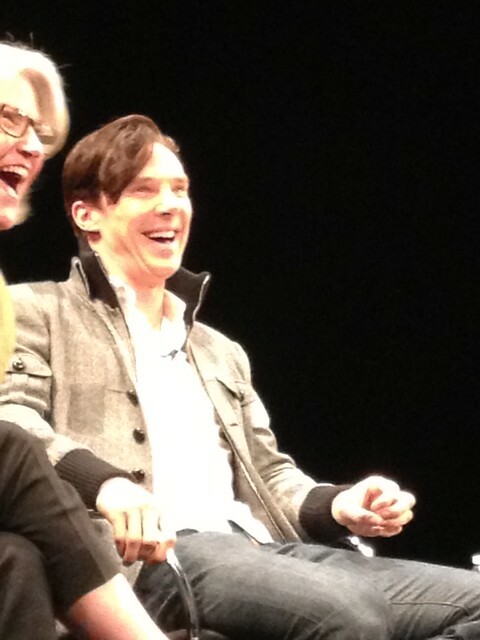 In the madcap week between MoCCA and TCAF, I went to the PBS premier event for the new season of Sherlock. I sat in the second row, and it was glorious. Look at that gorgeous jacket! The one on the gorgeous man. Hmm. Quite a nice view. I brought my mom with me this year! It was a nice weekend away with her, and she got to see a little of what I do at conventions, as well as wander Toronto a bit. It was funny how many people I ran into later who said, "...Did I see your mom walking around, or was that a time-travelling future version of you?" I look like my mom a bit, you guys. Anyway, it was a great show, as usual. I love TCAF. I didn't really have anything new to sell this year, as I'm sitting on a bunch of things yet to come out, but I had a great time, nonetheless. Until tomorrow, my good ol' Hot Dog shirt is available for purchase again on Woot! I was excited-- I like this shirt, and now it comes in LADY SIZES, which it didn't have before. I got another one. You should, too! Get my Hot Dog Shirt from Woot! And now for some exciting news: I'm going to TANZANIA in less than a week! To make comics for Saveur magazine, and presumably see elephants and zebras and basically run around going, "I AM ACTUALLY IN THE LION KING RIGHT NOW" while trying to resemble a serious travel diarist. The comic shall be something, indeed. Still plugging away on "Displacement" (Aka: the cruise comic)-- hoping to finish it up soon. Lot's of exciting comics on the way, pals! Back to work. Or to shop for Mother's day. It's too nice out to keep working right now. As you can probably guess from this page, it was quite a trip. Sorry about the delay. I'm hoping to be finished with it by CAKE (Where I'll be exhibiting!). 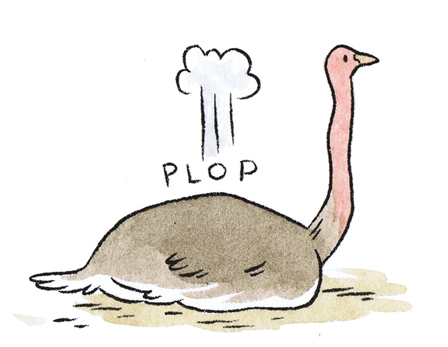 I'm also going to be at MoCCA, TCAF and (in November) Thought Bubble (My first UK show!). It's a short list of conventions again this year. As soon as Relish comes out, I'll blast through as many as will have me. But it works out nicely, because along with "Displacement," I've also got a few other exciting projects on the horizon this Spring! Like this: Did you guys see my first Adventure Time comic story? It was in Issue 2, and an absolute blast to make! I can't believe how many awesome people are involved with this series. Speaking of, have you heard about this amazing thing? I'm really excited to see the comic, and so pleased to be a part of the cover art! Also: There's another travel comic I'm going to be making in May, but I'll tell you more about it later because I'm too excited to even deal. Yooou'll seeeee! It's been a strange and tumultuous few months, but now it's all humid and hot and my priority becomes trying to make my hair look less weird. Today was the first hot day in NYC. It was pretty and everyone was outside. I managed to snag a half-hour of reading by the river while I waited for the post office to open this morning (I've been getting up early now that I'm on summer hours. It's to do with the light that comes in my bedroom). Did some work, cleaned/groceried, and then I went to the figure drawing session headed-up by an old childhood pal of mine. The model was especially good-- curvy and angular all at once! Here are a few watercolor sketches from the session. I seriously love drawing naked people so, so much. 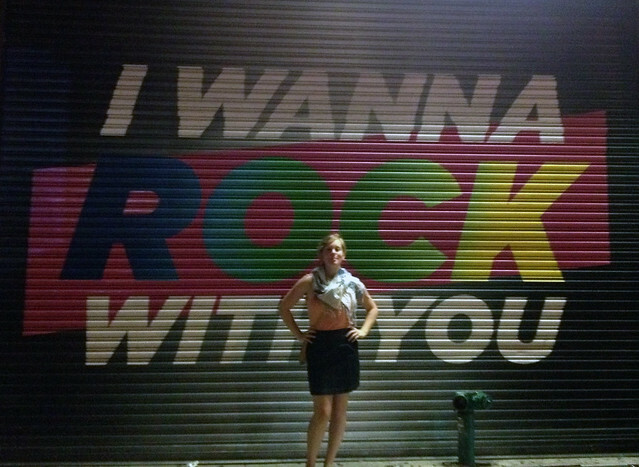 Last night my friend Holly and I went to a star-studded poetry event. I made some tipsy doodles about it last night. Here they are! I don't know if you guys know this, but I really really like television. 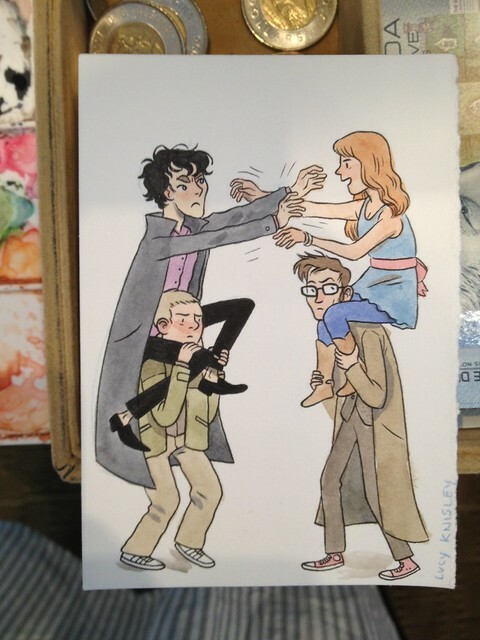 As a kid, there were inhibiting factors at play. Parental limitations, the infernal rabbit-ear antennae that never worked, and the fact that my favorite shows would usually only play once a week... While I was supposed to be doing my homework (I'm looking at you, Chris Carter... Moving to Sunday nights at 9...). But as an adult, I frequently keep the TV on in the background while I work, which means that I generally watch (listen to) a lot of TV. With the advent of streaming media, it's only gotten worse easier. Because of the aforementioned limitations, now I get to catch up on all I've been missing. Frequently, my poor understanding friends will be treated to my total shock at Spike and Buffy's secret tryst. Or my endless curiosity about the truth behind Gabrielle's mysterious trip into the underworld to save Xena. I get a little fixated. As a lot of cartoonists will tell you, watching something while working is a delicate balance. It needs to be interesting enough to occupy part of your brain without your full attention, but it can't be so interesting as to divert your eyes/attention entirely from work. I'm good at splitting my attention, but certain things get away from me. So when I hear about shows that compel frothing-at-the-mouth fandom, I usually try to stay away until I have a project that will take less than my full attention. Because the cruise-comic I'm working on now is a lot of inking/coloring, it seemed like the right time to open a particular can of worms I'd been putting off. An added factor of going through some other stressful work stuff tilted me over the edge of the cliff, and I vanished into the complete and total insanity of.... The Doctor. Anyway, I found myself needing to doodle in the margins while I journeyed through. Spoilers abound, but if you're familiar already, read on to hear about my first experience watching Doctor Who.